This is today's tribal print inspired by my favorite leggings from last winter! 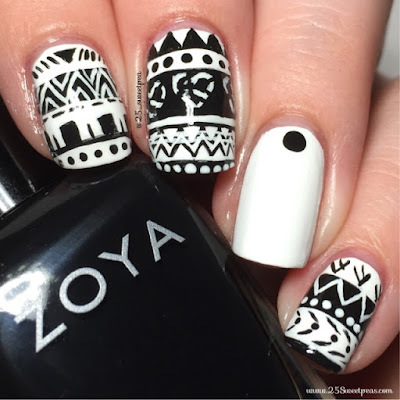 Polish wise I used Urban Outfitters Optic White as my base white and then black acrylic paint for all the details. I used my new Berry Wine Brushes from Winstonia, and I am loving them! I need to play with them more, and get used to them but I really do think I will be able to do a lot more now. :) They are fabulous! So this is my then and now picture. I really don't know what I think. I do see improvement but I am really wishing my current day nails had been shorter like in January because I feel like they would of looked more complete. I don't know if that makes sense but that's just my thought. Over all between the two I really just don't know. What about you, what are your thoughts on the two. I really do love a tribal mani though. There is just something about them that I always love. I hope to maybe work on a Christmasy one. What do you all think of that idea? Looking at them more I think I know what is throwing me off. 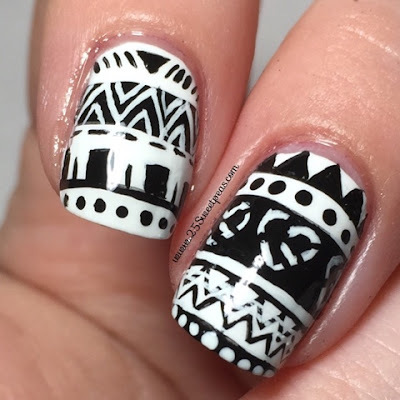 I round my nail corners so I don't snag things but I think if they were pure square in the corners they would look nice with this type of art. Just a thought! Last picture! Hope y'all have a lovely day and I hope you have enjoyed this post! If you want me to do more then and bows let me know! I do know of one more here soon for sure, but as always requests are always welcome!